A UN rapporteur declares that “sanctions kill” (Independent, 1/26/19)—but few in Western media are listening to his message. 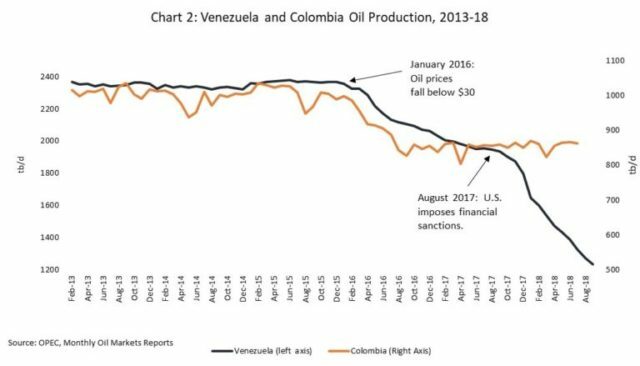 Economist Francisco Rodríguez (WOLA, 9/20/18) points out that oil production in both Venezuela and Colombia dropped when oil prices fell in 2016–but Venezuelan production plummeted when the U.S. imposed financial sanctions in 2017. The economist Francisco Rodríguez points out that the sanctions the Trump administration issued in August 2017 prohibited U.S. banks from providing new financing to the Venezuelan government, a key part of the “toxification” of financial dealings with Venezuela. Rodríguez notes that, in August 2017, the U.S. Financial Crimes Enforcement Network warned financial institutions that “all Venezuelan government agencies and bodies…appear vulnerable to public corruption and money laundering,” and recommended that some transactions originating from Venezuela be flagged as potentially criminal. Many financial institutions then closed Venezuelan accounts, concerned about the risk of being accused of participating in money laundering. 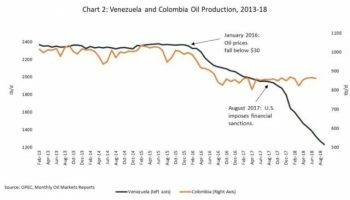 If we step back and look at Venezuela from a bird’s-eye view, how does a country with 500 billion barrels of oil and hundreds of billions of dollars’ worth of minerals in the ground go broke? The only way that can happen is if the country is cut off from the international financial system. Otherwise, Venezuela could sell or even collateralize some of its resources in order to get the necessary dollars. The $7.7 billion in gold held in Central Bank reserves could be quickly collateralized for a loan; in past years, the U.S. Treasury department used its clout to make sure that banks who wanted to finance a swap, such as JPMorgan Chase and Bank of America, did not do so. Sanctions have kept the Venezuelan government from accessing financing and dealing with its debt while hamstringing its most important industry. Given that U.S. media are writing for a principally U.S. audience, the damage done by Washington and its partners’ sanctions should be front and center in their coverage. Exactly the opposite is the case. Food and medicine shortages are widespread. Hundreds have died from malnutrition and illnesses that are easily curable with the appropriate treatment. What you’re likelier to read is that the crisis is the product of corruption, cronyism, populism, authoritarianism, resource-dependency, U.S. sanctions and trickery, even the residues of capitalism itself. These “funds” presumably refer the money that the U.S. has seized from Venezuela, and adding the country to list of “state sponsors of terrorism” automatically entails hitting it with further sanctions. 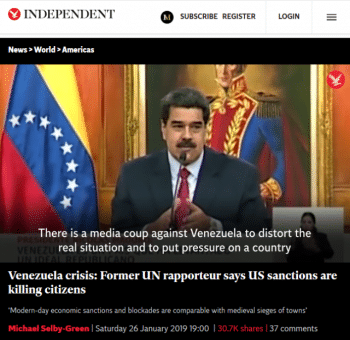 Later, the editorial said that “a U.S. boycott of Venezuelan oil could endanger ordinary Venezuelans already coping with critical shortages of food, power and medicine,” an absurd remark given that the sanctions they are occluding have had precisely these effects. Trump has many levers to pull short of military intervention to topple Maduro. He could use U.S. pressure on the global financial system to cut off regime access to international banks, freezing access to any secret accounts that the regime—and, probably, its highest-ranking leaders—established offshore. He can, as Sen. Marco Rubio (R-Fla.) has suggested, work with American oil companies that purchase Venezuelan oil to provide the profits from those purchases to accounts controlled by Guaidó’s National Assembly. He can also pressure China, which has a far more valuable relationship with the United States than it does with Venezuela, to withdraw its support. Any or all of these measures would ratchet up pressure directly on the regime, decreasing its ability to finance itself and buy support from security and military figures…. 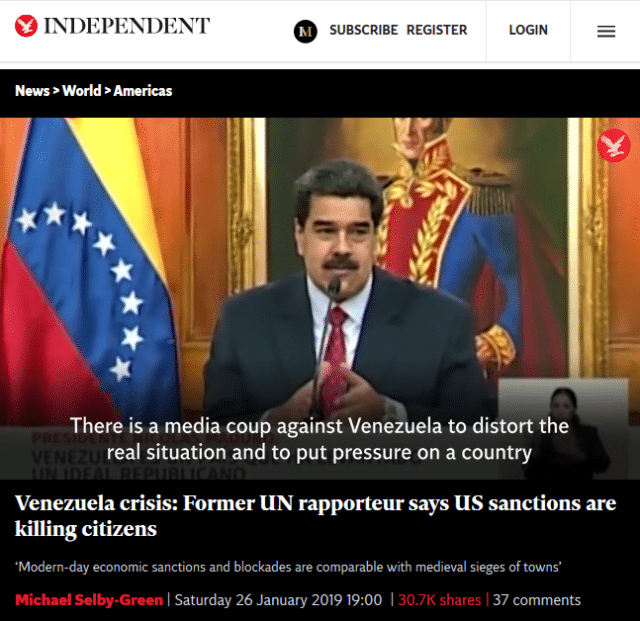 Even if one momentarily sets aside that the sanctions are illegal under international law and violate the charter of the Organization of American States, and that the U.S. has no right whatsoever to decide who governs Venezuela, these measures don’t just “ratchet up pressure” on “the regime,” they also kill and immiserate ordinary Venezuelans. 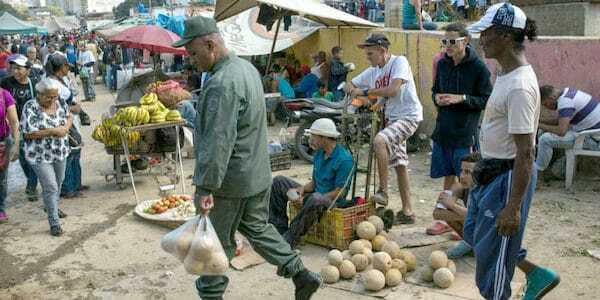 Apologists for the regime blame U.S. sanctions and destabilization for Venezuela’s problems. The truth is that, with the exception of the George W. Bush administration’s brief, halfhearted support for a coup attempt in 2002, Washington—learning the lessons of ill-fated Cold War interventions—has shown restraint in dealing with the Caracas regime. 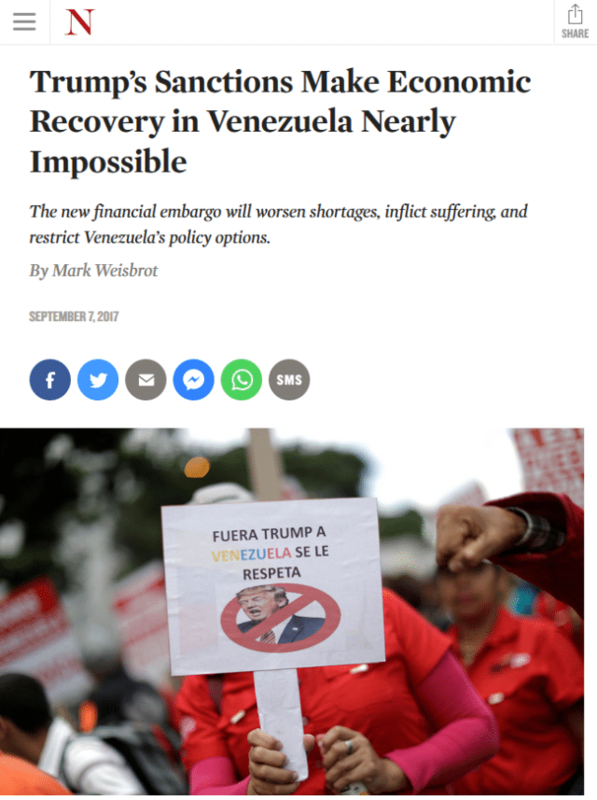 Thus, the U.S. government acknowledges that it is knowingly, consciously driving the Venezuelan economy into the ground, but U.S. media make no such acknowledgment, which sends the message that the problems in Venezuela are entirely the fault of the government, and that the U.S. is a neutral arbiter that wants to help Venezuelans.